So in light of this recent burrito craze, I figured I’d share my own. This may seem daunting at first as there are several layers of flavors and textures, but I can assure you that this can be thrown together in under 30 minutes. Personally I like to cook up large batches of beans and rice and freeze them in individual sized portions. It makes throwing a dinner like this cinch. Having pre-cooked beans and rice on hands has saved me numerous times when I’m scrambling for a quick meal to throw onto the table on into a lunch bag, and keeps me away from junk food and take out. I like to freeze cooked beans and grains in 1/2 cup and cup sized portions so they are easy to measure out for recipes. So back to the burrito bowl. 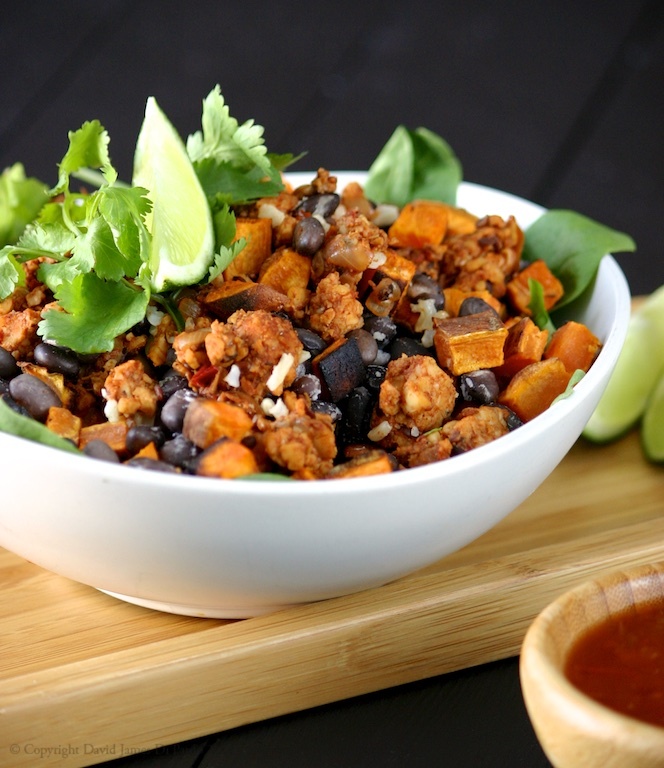 These tempeh-chorizo crumbles are the bomb! I can’t get enough of them. They would be great in tacos too, topped with some guacamole and re-fried beans, yum! You could make these with tofu, TVP or seitan as well, however I opted for tempeh. I like its firm texture, and due to the fermentation process its also easier to digest. If you’re pressed for time you can swap out pre-made vegan chorizo. Personally I like Upton Naturals Seitan Chorizo, which would work well in this dish provided you don’t have any gluten sensitivities. 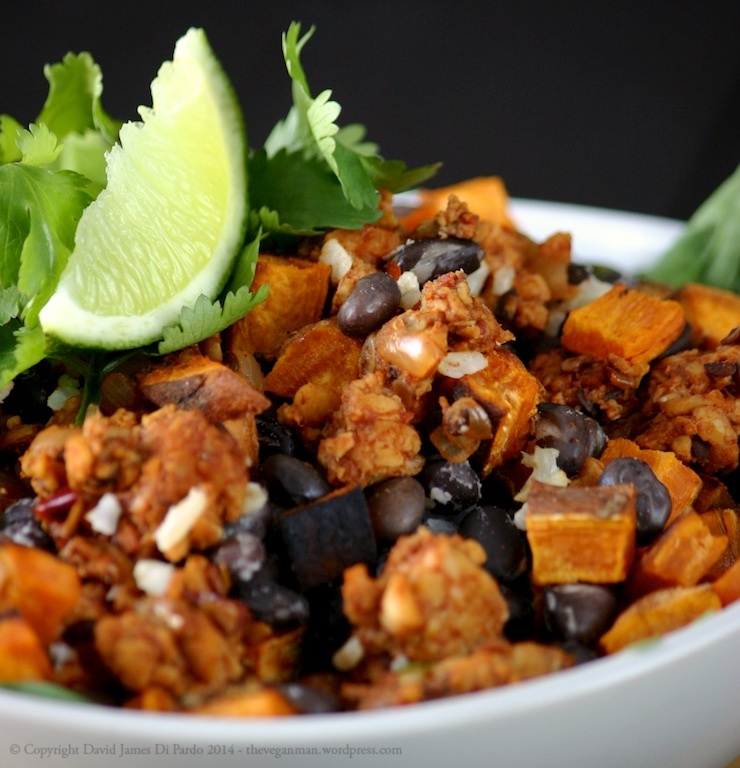 The combination of rice, beans, and sweet potatoes make this a nutrient dense, high fiber, high protein meal. 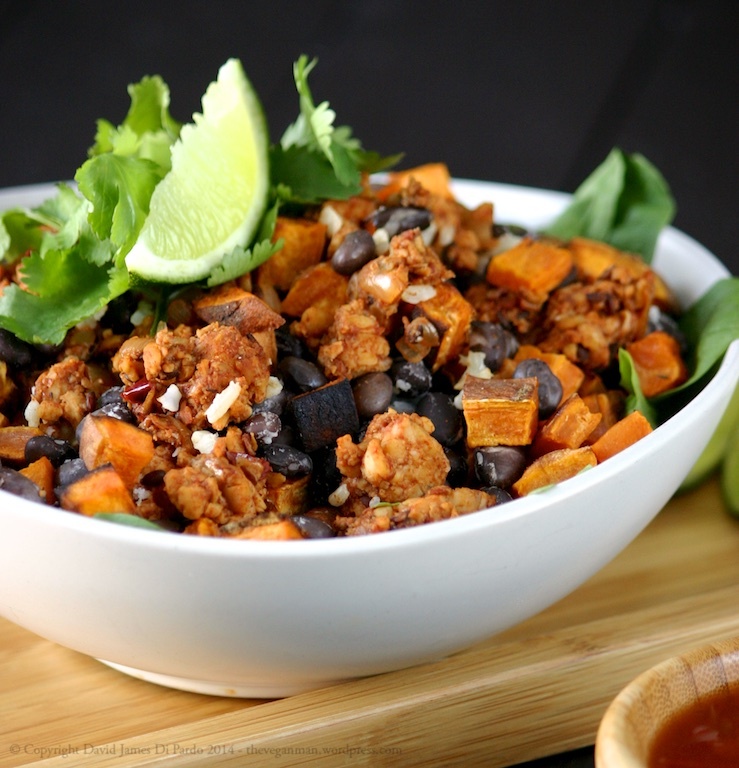 Sweet potatoes are high in vitamin A, vitamin B5, B6, thiamin, niacin, riboflavin, and their sweetness adds a nice contrast to the spicy tempeh. I like to serve these atop a generous mound of fresh greens for an additional nutrient punch, but feel free to throw these into tortillas if you’re looking for a more traditional style burrito. Top it with some avocado to up the amount of healthy fats and you’re got yourself a delicious, nutrient rich meal. Perfect for a post workout meal or even just a quick week night dinner. Preheat oven to 450°F and line a baking sheet with parchment paper, set aside. Cut sweet potatoes into 1/2-inch cubes and toss with 1 teaspoon of olive oil. Lightly season with salt and pepper and spread on prepared baking sheet in a single layer. Roast for 20-25 minutes until edges are golden brown and sweet potatoes are tender, stirring them after about 10 minutes to ensure they brown evenly. Remove from the oven and set aside. Meanwhile prepare the tempeh-chorizo. Heat remaining teaspoon of oil in a large non-stick skillet over medium heat. Chop the onion into 1/4-inch dice and add to the skillet. Cook for 4-5 minutes, until the onion begins to turn translucent. Add the tempeh and continue to took until beginning to turn golden brown, 2-3 minutes. Add the finely chopped chipotle peppers, spices, water and cider vinegar and stir to combine. As the mixture simmers use a potato masher or the back of a wooden spoon to break up the tempeh into large crumbles. Reduce the heat to medium low and continue to simmer for 7-8 minutes adding more water if the the mixture begins to dry out. The liquid should reduce by half. Season to taste with salt and pepper. Add the brown rice, black beans, and roasted sweet potatoes to the tempeh mixture and stir until everything is heated through. Divide the greens among each dish and top with the tempeh mixture. Top each bowl with salsa (2-4 tablespoons per bowl) and a sprinkle of fresh copped cilantro. Nutritional Info (based on 5 servings): 495 calories, 10.5g fat, 67.1g carbs, 18.5g fiber, 26.3g protein, 286.9% vitamin A, 16.8% vitamin C, 18.2% calcium, 32.3% iron.